This Rumble ended on 2004-09-30 00:00:00.0. Kingdom: A former elven city turned minotaur nation and a lake in the middle of a swamp. Died: Died just after killing the Queen of Darkness… neither one got better. Personality: Wishy washy, pushover, sappy, bratty and wimpy. Desires: The love of a human woman. Died: Died when he was pushed out a window by his father… but he got better. Desires: The love of anyone.. and just to SING! The servants at this castle were infuriating. Solvanoshi had been traveling for days across forest and field on his way to Sanction. He was trying to get to his beloved Mina when an arrow pierced the heart of his trusty aid. The arrow bore a note that someone was in trouble. After a long discussion with his trusty aid (who was not quite dead) Silvanoshi agreed to stop by the castle indicated in the note as long as it was on his way to find Mina. He traveled to the heart of a swamp and found the castle. His prestige and status were immediately recognized by the staff and he was ushered in side. Silvanoshi groaned inwardly. At first he thought it was a princess, but then he realized this was actually a human man in front of him. His clothing was nothing but hand-me-down elven silk that was far too tight around his chest and he obviously did not keep up with the latest royal fashions. Despite this, Silvanoshi smiled dutifully and introduced himself. He asked if anyone was in need of assistance because he has received a note. The young human prince grew excited and looked around. “I’m trying to escape my father! 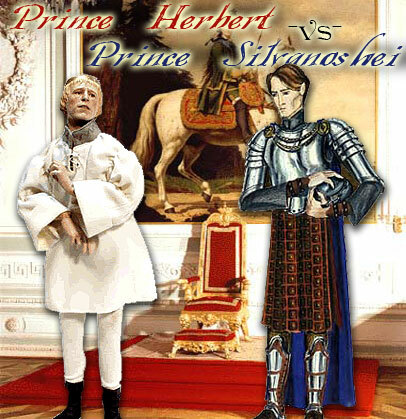 Let me tell you about my terrible childhood in the form of a song I wrote.” Prince Herbert cleared his throat. “No I don’t have time for it. I must be going.” Prince Silvanoshi said, very uncomfortable with the whole situation and not really sure how to escape without getting in some sort of trouble. The human prince pleaded and Silvanoshi backed away until he was stuck in a corner. Then when Prince Herbert started to sing Silvanoshi came out slapping at the human with his hands at a frenzied rate. Miffed that his song was interrupted Prince Herbert released all the pent up rage he had toward his father, closed his eyes, turned his head and started to slap back.